This sold for a huge sum, CHF408,000 including premium. We can see it exhibits correct 2915-1 characteristics, in that it has the correct dial with a dome, short sub dial indices, AML, and SWISS MADE, and a flat oval in Omega. The Condition Report, (not the catalog description, notes the dial is re lumed with tritium). 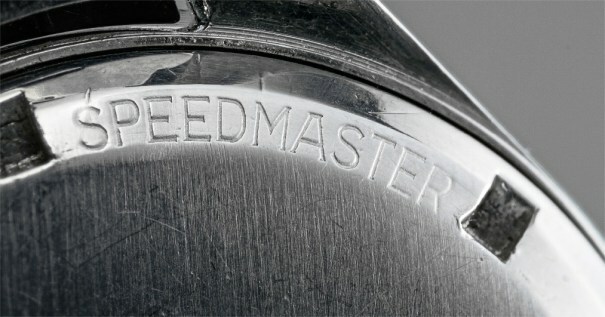 “The present Speedmaster example is however one of the extremely scarce -1 iterations, and furthermore preserved in extremely attractive condition: the dial is virtually flawless and has turned a perfectly balanced and harmonious dark chocolate color, the luminous material has evenly aged to an outstandingly attractive intense tobacco hue. According to the Archives of Omega, it was sold in Costa Rica on December 17, 1958. This would suggest a mid-1958 production date which perfectly matches some details of the specimen: the caseback is still blank, without Seahorse engraving, and this is possibly one of the very last examples made with this caseback. The bezel instead is a Mark II version, with rounded 3 instead of flat one. Mid-1958 is exactly halfway through the production run of the model, a detail which perfectly explains this rare “transitional” configuration. 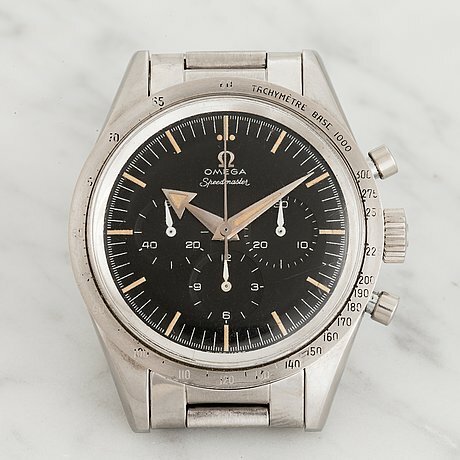 So to summarise, this is a special example of the first Speedmaster, with a Chocolate dial and apparently original specification, with box, papers and an extract. It ticks all the boxes for an ignorant naive “Investor” buyer and is a testament to Phillips ability to present a watch, which is frankly, fantastic. (the presentation!). Has the case been Polished? Does the whole package ring true? The Bukowski watch was sold with the description of it being hidden away with one family all its life, so the weight of evidence is that this is an original bezel. As you can see it lacks serifs. Look closely at the “T”s which are straight lines across the top, no drop serifs. So we can safely say the two bezels were not made in the same way. Going back to the Phillips watch, what about the hands? Again we have little to go on in terms of certified originals, but these ones have a transverse curve and look like they could be original, as opposed to the service hands which are flat. The lume deterioration adds to the impression but that can be created by skilled craftsmen. EDIT: I missed the updated catalog description that actually calls this a relume – It is carefully worded to say, “some time ago…” but it is still a confirmed relume. (Thanks to Mr Inox for sending me the condition report that was not accessible to me). What goes against this as having original hands is that they are matching in colour with the dial plots, and this is something I now associate with possible re lumes. Again comparing the Bukowski watch where we see a difference in colour between the hand lume and the dial plots. Cases are always polished, to some extent. In the case of all the watches on this page they have been polished but not destroyed. And at least the cases have not been rebuilt like the 2915-1 sold by Christies for an unforgivable $137,000 in December 2015. So what about the price? Well when the Bukowski watch sold for $275,000 and the thoughts among my friends was it was an outlier, where someone really believed the story, (and why not) and two people really wanted it. We did not think it was a repeatable price. How wrong I was. A quick precis of my opinion on this is that the dial is round oval, where I would like to see an oval in “Omega”. The short incies sub dial is there, and the AML. The hands, from this one photograph look a little flat and I would like to eliminate the possibility they are later additions, especially given the matchi – matchi lume colour. The bezel lacks any serifs. So where are we with 2915’s? Well I think I have learned a little for the bezels, and I have some direction to research. The prices are looking like they are headed upwards but there are so few available it is hard to really name the price as high or low. Lets see what happens at Christies.